Ion Iliescu (born March 3, 1930) is a Romanian politician. He joined the Communist Party in 1953, and became a member of the Central Committee in 1965, serving in various positions until Nicolae Ceauşescu was overthrown in 1989. 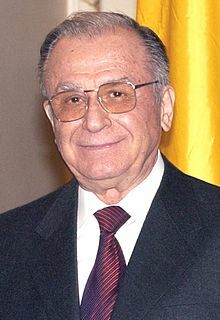 Iliescu was the elected President of Romania for eleven years (three terms), from 1990 to 1992, 1992 to 1996, and 2000 to 2004. This page was last changed on 17 July 2018, at 21:34.